Irwin and Jakks are almost all I ever customized. Kibito is one of those characters that is difficult to boil and pop, because his torso is made of very hard, thick plastic and he likely has a very thick peg inside him that is glued and helping hold him together. You have to put him in boiled water, let him soak, put on gloves and eye protection, and use an x-acto knife to slowly stab him apart at the seams. Which basically involves stabbing him carefully multiple times until you have stabbed through every area of his torso. Then you can hopefully pop him apart. I must caution you, that method is fairly dangerous to both your hands and everything else, because if you snap the blade in half it could go flying. Another option is boiling him then hammering a sharp, thin screwdriver into his crotch and shoulders. You'll have to have him held in a vice or something similar so he will stay still. I don't recall if Kibito has waist articulation or not, but if he does, then the upper torso has to be popped first before the crotch/hips can separate. I'm pretty sure I popped a Kibito one time, but I'm not 100% sure. Hey everyone... I'm working on a custom and had a quick question. Anyone have any ideas on how I could make the SHF Nappa figure's shins longer? 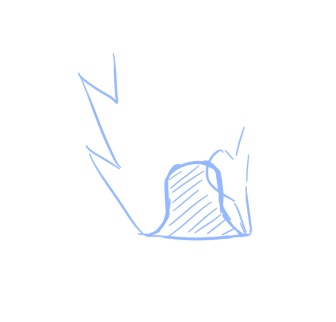 I'm taking a look at it and it seems more difficult than something like the basic Goku or Vegeta style body, but he's got these stubby little shins that I just can't stand, and since I'm already going to work on him I thought I might try to fix it. Any thoughts? I would imagine the best way would be similar to leg lengthening surgery. Cut the shin horizontally and fill it in with whatever sculpting clay you have till it's at the desired length. I cut off the uh, rope-ring thing around his boot, and I think what I might do is just try to pull that joint right out of the socket... and hopefully, embedding it in some milliput will be enough to keep it solid when I extend the leg. My experience with milliput has been that it's pretty dang solid. Hoping it'll work out... I just hope I can actually find a way to get this joint out of the leg. Well, I can't speak specifically to Nappa or Figuarts, since I never customized those specifically, but what I always did to lengthen shins on Irwin and Jakks figures was sliced them in half with my x-acto knife (or sawed them with my dremel) and then I would cut a glue stick (for a hot glue gun) to the length I wanted, and I would epoxy or super glue that between the parts of the leg. Then I would use apoxie sculpt and fill in the gap and blend. I don't know if super glue sticks well to the plastic Figuarts are made of, if it doesn't, then you'll have to use epoxy. Nothing worse than moving a leg and having all your hard work snap in half. Epoxy was always the solution for Irwin and Jakks figures. For Bandai products like the Ultimate Figure Series (UFS) though, Super Glue was a better hold, as epoxy would not stick to whatever plastic Bandai made their arms and legs from. And I always use Loctite Super Glue, which can be purchased at Walmart, for my super glue of choice. My epoxy came from Hobby Lobby and is this: www.hobbylobby.com/Crafts-Hobbies/Model-Kits/Paint-Brushes/5-Minute-Quick-Cure-Epoxy/p/146626 Trying to just let Apoxie Sculpt or milliput provide the hold is a bad idea. It isn't that good of an adhesive. It's better to have a good, strong, bonded structure underneath the sculpting work. A hot glue gun stick isn't the most ideal for strength... I often used pieces of plastic I had cut off other figures instead. But glue sticks are very easy to cut, and cut STRAIGHT. So they are a lot more user friendly than using a plastic chunk you cut off some other figure's leg or arm. Plus, you don't have to sacrifice some other figure's arm just to lengthen a custom figure's legs 1/4 inch. Playing around test fitting parts and discovered that awakening Goku's hair and SSJ Saiyan armor trunks hair's pegs line up almost perfectly. Customizers, you can pull this off this hair style easily. 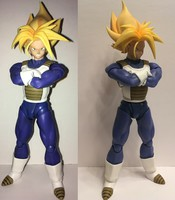 *Note* the neck joint was replaced with the SSJ 1.0 neck joint so it would fit this body. YOOOO... I LIKE it! I have no idea what character to use it for... but damn that's a nice look! 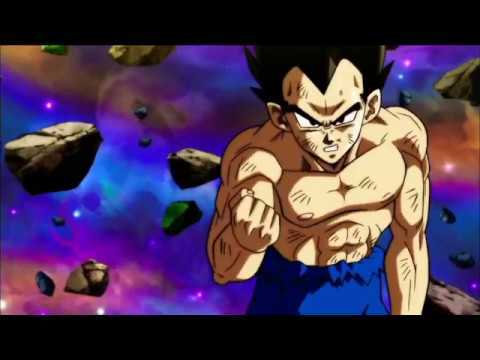 Pro costumizers, quick question: how would you guys go about swapping figuarts head with dragon stars body?? What head are you trying to use on what body? It boils down to the neck peg and the range of motion you want to get out of it. Question: How permanent of a swap are you aiming for? Are these Dragon Stars bodies going to be these heads' new permanent homes? Side note. 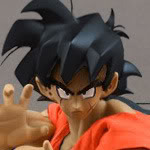 The old Super battle collection special Goku and those head fit perfectly on the Dragon Stars Goku body. SSJ 3 articulation is limited for obvious reasons. I'll snap some pics. Gimme a sec. The Super Battle Collection figures tend to go for a pretty penny though, especially if you're just going to buy it for the head. If you've already got the spare Figuarts heads, might as well just modify them, especially if you don't mind it being permanent, like you said. When you say that you want the articulation to remain the same, I assume you mean the same as the Dragon Stars, because... Well, if you're not using the neck joint from the Figuarts, you can't have the Figuarts' level of articulation. It'll just be the ball joint articulation of the Dragon Stars. Also, this is going to sound like a really extreme endeavor, but trust me, it's worth it. Learning this skill will serve you very well in creating essentially any heads you want for your figures. What you'll need is a power drill, a hobby knife, and a strong putty like Milliput (this is just the brand I use). From here, you'll need something like Milliput. Mix a little bit of it, put a ball of it into the hole you've drilled, and push it to the back/bottom of the hole. (NOTE: Be VERY careful not to touch the figure OR the head when your hands are covered in the putty that you've mixed, because it stains the figure, so unless you're planning to repaint, after you mix the putty and put the ball into the hole, go wash your hands and wipe them off thoroughly with a rag. The putty won't start curing for at least 20 minutes.) You might need more putty than you think at first, because what you're going to do is basically create your own socket for your ball joint. Put the ball joint of your Dragon Stars into the socket you've drilled, with the putty in it, firmly but without twisting or disturbing the putty too much. Just make sure that it fits pretty tightly, but without burying your neck's ball joint. Let the putty dry somewhere where it can sit without being disturbed, or without the figure falling over. I recommend laying it down in such a way that the neck/head is propped up in the correct position, so that it's still tightly in the putty and the head isn't hanging. 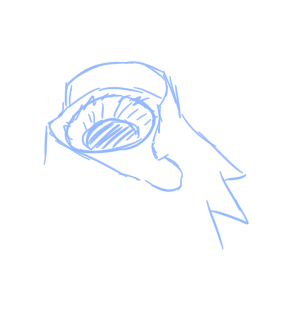 Put something underneath the figure to give the head and the body proper support, because leaving it standing up will probably result in the head flopping over and wrecking your would-be socket. After about a day (it can be less time than that to dry, but we want it to be as strong as possible, so give it a full day), try moving the head around on the neck. It'll show some resistance at first, because the putty will have bonded to the neck joint, but put a little bit of force into it and it'll move out of place and be able to rotate. See if it feels tight enough. If it isn't, mix a tiny bit more putty and put it in, making sure to envelope a bit of the sides of the ball joint this time, and try again, let it dry again, repeat for necessary trial and error. This is how I do all my 'unnatural' head swaps, when I use a WCF head on a Figuarts, or swap heads between lines like SHF, Dragon Stars, Irwin, etc. You need to create your own joint. 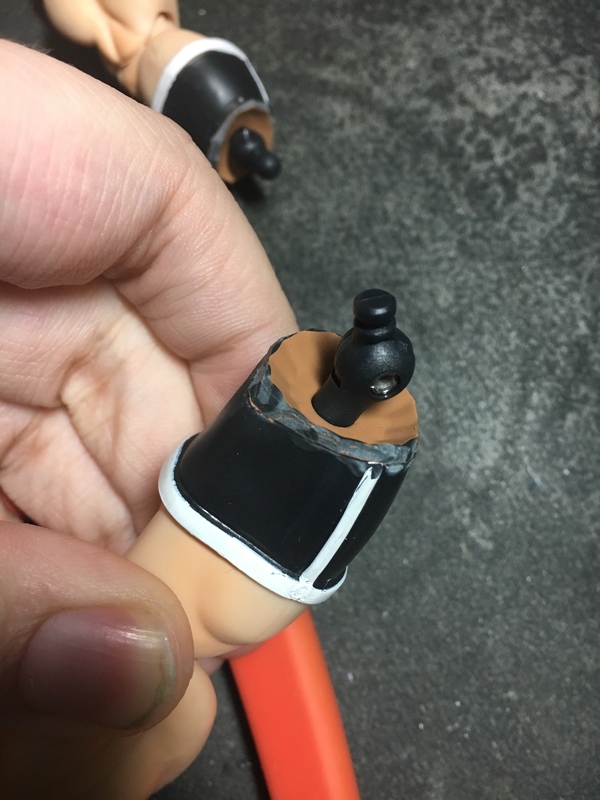 Using a little bit of milliput can also tighten loose Figuarts joints, or make a head whose socket is too large to fit on a ball peg tighter, enough to fit on a body it isn't meant to (ie mixing 1.0 and 2.0 parts for the same character, sometimes there's looseness-- you can fix that pretty easily). It sounds like a lot of effort, but the drilling is the hardest part. The putty is just a bit time consuming. Once you have this skill in your belt, a lot of new stuff becomes possible, even when you're not the kind of person to do sculpting or painting on your figures. It's just a very useful thing to be able to do. Your ability to customize heads is essentially limitless if you know what you're doing. thanks for the tip, but honestly im not that skilled lol. but i might give it a try on one of the heads that seems useless to me.